Brian Marz's Fly Fishing Oregon Blog: It's Salmon Time! With the last few days of rains, river levels on the coast have spiked up, and are on the drop now. The first major salmon fishing in the fresh water reaches of the coastal rivers should be in full effect. 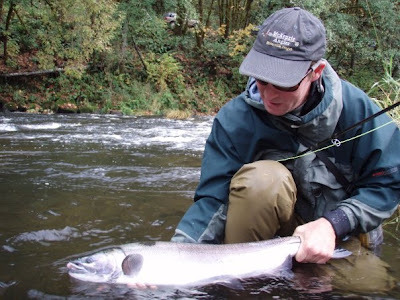 Fishing for Chinook and Coho Salmon will be good on many of the coastal rivers for the next several weeks, and it is all about being at the right place at the right time. You have to find a spot that concentrates the fish through bottle necks in the river, or pools that the fish accumulate and rest in. Once you find the spot, it is better to stick there and fish until waves of fish pass through. You will have red hot action for minutes, and then it will cease for minutes again until the next slug of fish pass through. Many days, your rod is folded over with a fish on more than you are actually fishing. What a dilemma to have......fighting fish and having fish on for large portions of the fishing session. 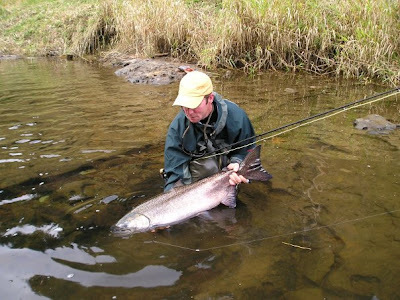 Fishing methods for river salmon range from swinging small sparse wet flies, retrieving sparse wet flies, or dead drifting slots and bottle necks with egg pattens and heavier wet flies. 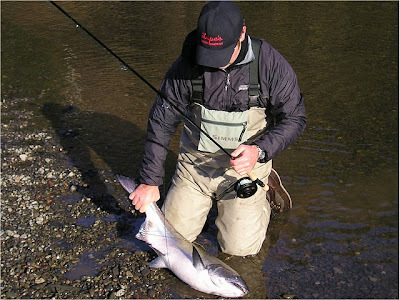 Fishing techniques are best dictated by the type of water that you are fishing in, and also to some extent how far up the river you are fishing. Conversely, you do not want to fish too far up many of the rivers; since the fish turn fast in the fall into their spawning mode. They should be left alone to take care of their business once they are higher up in the rivers. Most of the rivers have regulations set up where they are open only where the fish will be in their prime, and they are closed above those stretches for the fish to be able to reproduce successfully without any angling pressure. Fall salmon fly fishing is a super enjoyable way to spend a day before the nasty winter weather really kicks in. It is all about timing and being at the right place at the right time, but when you line up those conditions, you will experience some amazing power of fish right out of the Pacific Ocean. Get yourself out there! !